In November 1946, a tall, mustachioed figure stood alone on a railroad platform at Washington’s Union Station, waiting for the president of the United States to make his ignominious return to the capital. In victorious times, the platform would have been full of welcomers; as it was then, at the time of their party’s defeat, Dean Acheson, the future secretary of state, was the only one waiting for President Harry Truman. Truman and Acheson’s Democratic Party had just suffered shattering midterm election losses: 55 House seats and 12 senators. No wonder that the D.C. Democratic establishment abandoned the accidental president at his dark hour. Their meeting coincided with the start of a most-unusual electoral cycle in American history — one that a new crop of Democrats, some 65 years later, are eager to repeat. Texas, whose Republican legislators exercise power with the same understated nuance as a laser blast from the Death Star, has created a map that adds four new seats — which should lead to the Republicans gaining a net of two seats — and shores up two vulnerable freshmen. California, meanwhile, has entrusted its redistricting to an independent commission, and the draft map will shake up the typically uncompetitive House contest in the Golden State if it is enacted. Democrats are expected to benefit at the end of the day, but the map is not final. Notes: Latham is running against incumbent Democrat Leonard Boswell in Iowa’s reconfigured Third District, a race that we rate as a toss up. Critz, Peters and Landry likely will have to face more senior members in primaries in order to remain in Congress. Several Illinois Republicans were drawn out of their districts, but the bottom line is that at least one Illinois Republican, and probably more, won’t be in the next Congress. As for the states gaining seats, effectively three of the four seats Texas is gaining should be Republican. Arizona, a nonpartisan redistricting state gaining one seat, and Florida, which is gaining two seats and whose Republican legislators may be constrained by a new “fair districts” state constitutional amendment, are difficult to judge at this point. Florida, in particular, looks ripe for Democratic gains: despite its status as perhaps America’s premier swing state, Republicans control a lopsided 19 of its 25 House seats. New seats in Nevada and Washington probably will go to Democrats, while new seats in Utah, South Carolina and Georgia will almost assuredly go to Republicans. 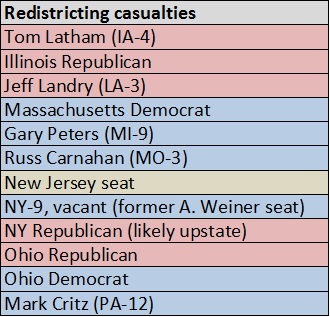 With all the necessary caveats about the uncertainty of once-in-a-decade redistricting, not to mention the unknown strength of the eventual candidates who emerge in individual races, here are our initial rankings of 2012’s House races. 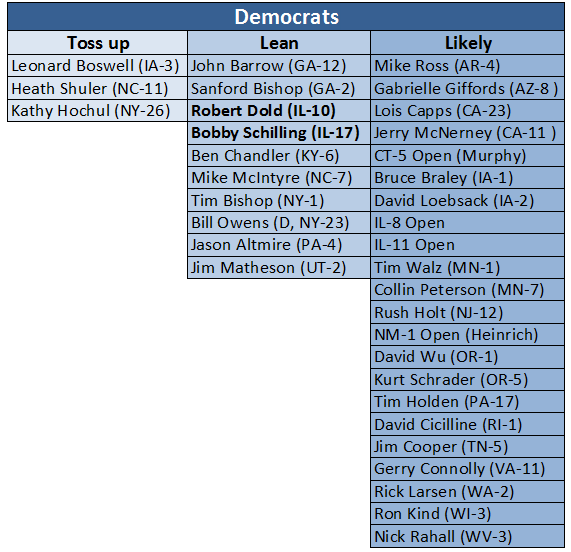 As always, toss ups can go either way, lean seats slightly favor one party or the other and likely seats are seats where one party is clearly favored. Seats not listed are currently considered safe for the incumbent party. Many of the Republicans who won for the first time in 2010 represent GOP-leaning districts. For instance, with the exception of Florida, Republicans picked up 18 seats in the remaining 10 states of the old Confederacy. Only one of those seats (Rep. Renee Ellmers, R, NC-2) is on our list, but her district was made more Republican in the likely new congressional map, and she is an early favorite to win reelection. Most of the other seats are districts that, under the old congressional map, Republican John McCain won in the 2008 election. The midterm election of 2010 dealt yet another blow to the moderate “Blue Dog” Southern Democrat, and the seats they lost, barring scandal or surprise, likely will not be competitive in this next election. In general, Democrats have few opportunities in the 22 states that McCain won in 2008; of the 46 Republican-held seats listed on our charts of competitive races, just six are in McCain states. 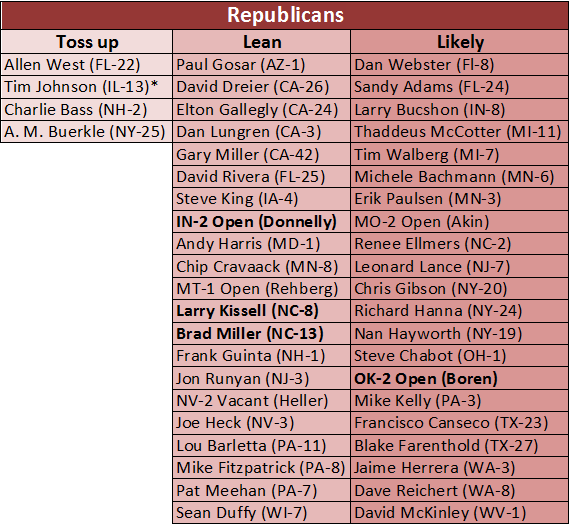 Likewise, of the 35 Democrat-held seats listed on our charts, only eight come from McCain states. That’s because the Republicans already knocked off many vulnerable Democrats in Republican-leaning districts and states last year. But other than Illinois and potentially California and Florida, there aren’t obvious places where Democrats are poised to capture a significant number of seats. Democrats lost a dozen seats in 2010, for instance, in Michigan (two), Ohio (five) and Pennsylvania (five), which would seem to be good places for Democrats to counterattack. But Republicans control redistricting in all three states, and this will limit Democratic opportunities at least in the short term. Ohio, whose House delegation was 10-8 Democratic before the 2010 election, could have a 12-4 GOP House delegation encased in concrete after redistricting. Meanwhile, a Michigan map that should at least slightly help GOP incumbents awaits Republican Gov. Rick Snyder’s signature, and Pennsylvania Republicans likely will shore up their incumbents. The California rankings are based on a draft map released several weeks ago by the state’s nonpartisan redistricting commission, but that map probably will change, possibly significantly. One thing appears clear, though: California, which under its last map saw only one House seat change hands — Rep. Jerry McNerney (D, CA-11) defeated Republican Richard Pombo in 2006 — should see a lot more competitive races in upcoming elections. As maps are approved — a process that probably will not be completed in all states until next year, especially with an expected bonanza of lawsuits that will act as a stimulus package for the legal profession — the picture will get clearer and this list will undoubtedly go through many revisions. Democrats need less than a third — 24 — of the seats Truman’s Democrats won in 1948 to recapture the House, but it is still a very tall task. History is not in the Democrats’ favor: In 16 post-World War II presidential elections, the party of the winning presidential party has picked up an average of only about 13 House seats. And that average is skewed upward by the 1948 Truman landslide. Can they do it? Paul Ryan’s budget plan, which would effectively change Medicare into a voucher system, gives Democrats a potentially potent weapon, especially among seniors, who are the most committed voters. And an economic recovery, combined with a weak GOP presidential candidate, could sweep Obama back into office with, if not Truman-like coattails, enough strength to move the House back into the Democratic column. Such a combination of sunny factors for the Democrats is an unlikely forecast, but in this era of wild weather, it is at least possible. Moley and many other commentators were far off the mark on their predictions in 1948, although one doubts that even Truman and Acheson, standing on that railroad platform two years earlier, could have predicted the Democrats’ miraculous comeback. So at this very early stage, the Crystal Ball would place a decent-sized bet on the Republicans to retain the lower chamber of Congress. Yet out of an abundance of caution — instilled by history’s sometimes erratic, fickle gyrations — we are not yet ready to write off Democratic chances in the House completely. There are too many land mines on the long and winding road to November 2012 for both parties to be absolutely sure of anything 481 days before America votes.